The memories of heroes are preserved the world over in place names, patriotic holidays, printed images on money and stamps, folk songs, roadside shrines, and on web sites. Understanding the origin and meaning of these forms of symbolic political speech is a way to understand cultures and histories. The essays collected here address symbolic political speech associated with the bodies (and body parts) of martyred heroes in Latin America. The authors examine the processes through which these bodies are selected as political vessels, the forms in which they are venerated and memorialised, and the ways they are invested with meaning. Since colonial times governments and their political enemies in Latin America have struggled to control or appropriate the powerful symbolic powers associated with the bodies of the revered dead. Early examples discussed in this book include Cuauhtemoc, the Aztec ruler executed by Spanish conquistador Hernan Cortes in 1524, and Tupac Amaru, the rebel Inca ruler executed by a Spanish viceroy in Peru in 1572. In both cases the bodies were denied to followers by authorities but were reclaimed symbolically by later generations who found enduring meaning in the sufferings of these martyrs. More recently, the bodies of Evita Peron and Che Guevara were recovered and appropriately reburied by admirers and loyalists. The authors explore the region's mixture of cultures, the legacy of Catholicism, and the persistence of underdevelopment, as they illuminate why the heroic dead in Latin America are likely to speak the language of social protest and resistance to foreign exploiters.
"" Death, Dismemberment, and Memory " represents an important addition to Latin American political history and popular culture. . . . Highly Recmmended." ""Death, Dismemberment, and Memory" is as fascinating as its title suggests. . . Johnson's anthology contributes significantly to the understanding of how many of Latin America's most prominent national figures are remembered." 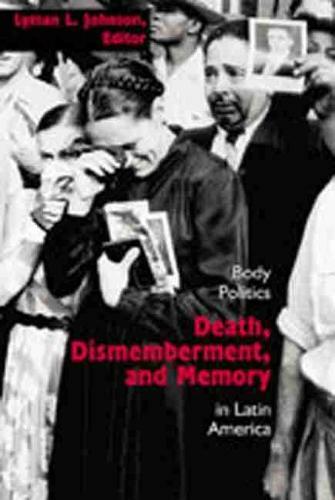 " "Death, Dismemberment, and Memory" is a valuable contribution that illuminates Latin American history and politics in refreshing ways...the engaging, highly informative essays are excellent catalysts for further study of Latin American body politics." ""Death, Dismemberment" is wonderful. . . This is a valuable work for those interested in popular religion, death rites, or religion and politics, as well as for anyone exploring the redemptive possibilities of real and perceived heroic death. . . this collection is cohesive and consistent." "Each chapter is well crafted, the parallels in the narrative structure are most useful, and the edited book is more consistent from essay to essay than many such anthologies. Each essay is enlightening and provides grist for symbolic-metaphoric-topic mills that may be brought forward by critical and insightful readers." ""[Death, Dismemberment, and Memory]" represents an important addition to Latin American political history and popular culture. . . . Highly Recmmended." "["Death, Dismemberment, and Memory"] is a valuable contribution that illuminates Latin American history and politics in refreshing ways...the engaging, highly informative essays are excellent catalysts for further study of Latin American body politics."